Tamares Telecom fiber-optic network offers the fastest and most optimal route plan for the ever-increasing destinations’ connectivity demand. Our most popular routes from Israel (Tirat Hacarmel PoP) are: Frankfurt, London, New York, Hong Kong and Mumbai. Through-data traffic to New York and other North American locations are best served from London Exchange. Coupled with a built-in element redundancy, Tamares’ network offers speed and availability. We continuously invest efforts in maintaining and further improving our service portfolio. Having deployed the newest and most innovative network, we are proud to offer the best, resilient, durable and shortest path between Israel and Europe. 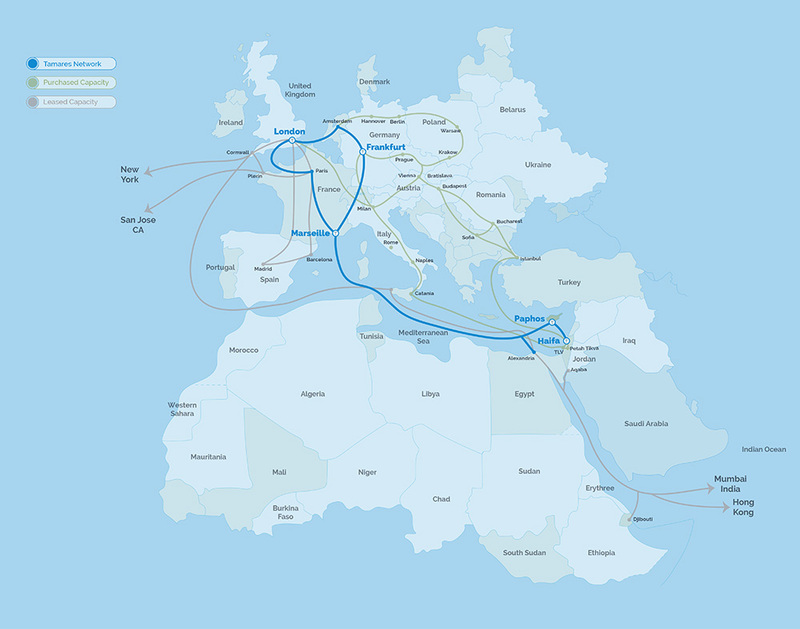 Our network includes a fiber-optic cable from Haifa-Israel to Marseille-France, without any segments overland and with a ring connection to the main worldwide web hubs: Marseille, London, Amsterdam and Frankfurt. The four hubs offer ultra fiber optic connections to New York and all other strategic hubs around the world.